For Thanksgiving last week I baked my traditional contributions to the feast hosted each year by our friends Michele and Charles: a dessert and a bread. The dessert this time was a hazelnut torte, and the bread a focaccia. I’ve written about my focaccia before, so today I want to talk about the torte, which is a paragon of simplicity and flavor. 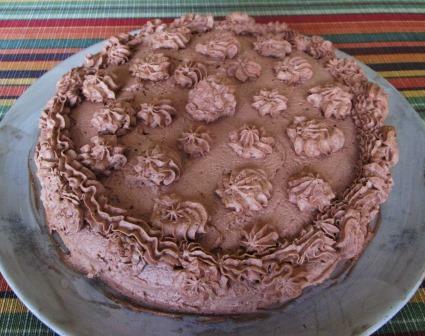 Now, don’t laugh at its appearance: I’m hopeless at cake decoration, and I had a lot of luscious icing that I couldn’t bear not to use. Those wobbly rosettes were all I was capable of. Gorgeous it wasn’t, but it was very, very good. 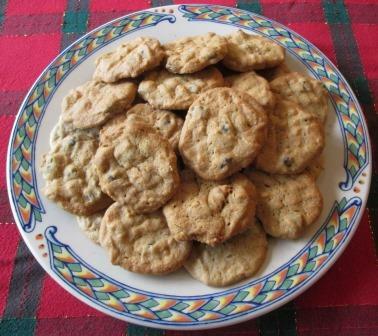 This easy, delicious recipe was given to me by my Italian friend Maria over 30 years ago. It was her adaptation of a recipe from a British magazine, which she’d written up for herself in Italian. My copy, a yellowed sheet of paper, never translated but now heavily annotated by me, has had an honored place in my recipe binder ever since. The only thing slightly labor-intensive about it is shelling and toasting the hazelnuts (if you don’t have a ready-prepared supply on hand, as I do). Even that isn’t so bad, because you don’t have to rub off the nuts’ brown inner skin, which is a maddening task. Eight minutes in a 350° oven is all it takes, if you need to. 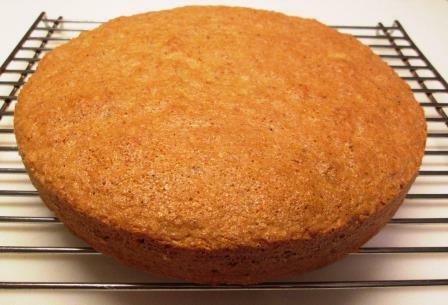 To make the cake, I energetically whisked together 2 jumbo eggs and ⅜ cup of sugar; added 1 tablespoon of flour, 1¼ teaspoon of baking powder, and 1 cup of ground hazelnuts; transferred the batter to a buttered and floured 8-inch pan, and baked it at 350° for 20 minutes. This is a delightful cake just as is, or with a dollop of whipped cream. For home consumption, I usually stop right there. It tastes and feels light on the palate, nut-sweet rather than sugar-sweet. For Thanksgiving, I wanted something dressier, so I went on to make Maria’s recipe for the icing, which is also amazingly easy. I stirred 2 tablespoons of unsweetened cocoa powder, 2½ tablespoons of powdered sugar, and a few drops of vanilla extract into a cup of heavy cream. Whipped on high speed in my heavy-duty mixer, the combination turned into a luscious buttercream icing in less than a minute. It too wasn’t sugar-sweet or heavy – a gentle mocha kiss is more like it. I know that, strictly speaking, a torte should have more than one layer. The full written recipe, which serves 12, calls for 2 cakes, to be sliced in half horizontally and assembled with 3 internal layers of icing. With only 6 of us dining on Thanksgiving, I made just the single cake. If I’d had a slightly smaller pan, the cake would have been thicker and I could have halved it. But with a cake only an inch high, it was too risky to attempt. Nobody at the festive table seemed to mind the absence of internal icing: Maybe the rosettes made up for it. 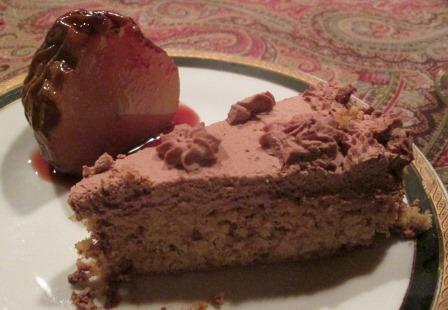 The torte went beautifully with the wine-poached pears that were the other dessert of the day. Last week I wrote about the bread I baked for Thanksgiving dinner at the home of friends. I also always bring a dessert. To avoid overlapping with other desserts, I asked my hostess what flavor she’d like this year: apple, pear, pumpkin, lemon, chocolate, or nut. She chose nut. That gave me the fun of hunting through all my cookbooks for nut pastry recipes, because that’s not a type I usually make. 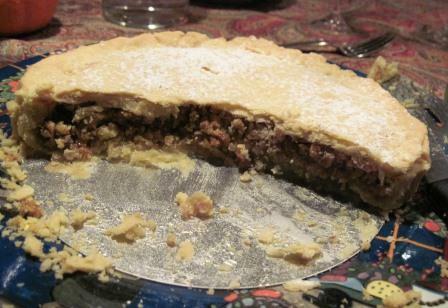 A nut cake would’ve been a cinch, but Thanksgiving seems to call for pies or tarts. It was hard to find a recipe I liked. In many books, all that I saw were in the style of pecan pie – thick, gooey, excruciatingly sweet. After all we would have eaten by the time we got to dessert, I didn’t think any of us would really welcome that much of a calorie bomb. 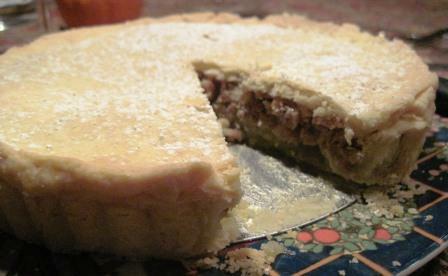 Finally I came upon a simple recipe called “A Tender Tart” in the pastry volume of the Time-Life Good Cook series. 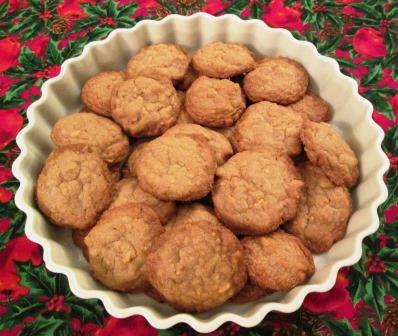 The only filling ingredients were chopped hazelnuts, egg, sugar, and vanilla. I love hazelnuts, and I had some beautiful peeled and toasted hazelnuts from Italy, preserved in shrink wrap. Just the thing! 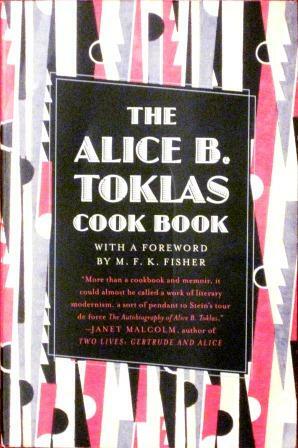 Then I noticed that the recipe was attributed to The Alice B. Toklas Cookbook. That was a flash from the past. Back in the late ‘60s, Toklas was all the rage on college campuses for her book’s finally-released-from-censorship recipe for Hashish Fudge – which, with locally grown ingredients, generally morphed into Marijuana Brownies. Those days were fun to remember; and I also remembered that I used to own the cookbook. It sat on a shelf alongside The Impoverished Student’s Book of Cookery, Drinkery and Housekeepery. That one I still have, but Toklas had disappeared. I needed a replacement! The copy I ordered from Amazon arrived the very next day. It’s a fascinating little book, as much a memoir of Toklas’s life with Gertrude Stein as it is a recipe book. 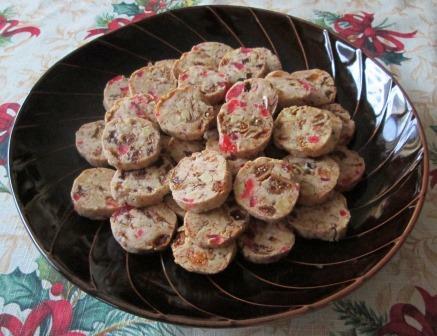 To my surprise, when I read its Tender Tart recipe I found many differences from the version published by Time-Life. The ways of cookbook editors are mysterious. 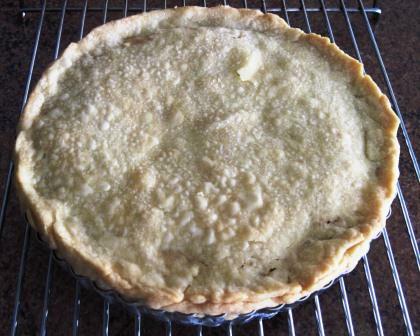 To begin with, the T-L recipe asked for a 7-inch tart pan with a detachable bottom. Toklas said nothing about size, specifying only a deep pan, also detachable. Leaving the size alone, I couldn’t see why it needed to be detachable, since pastry normally has so much butter that it never sticks to the pan. (In the end, I found out why; I’ll get to that.) Well, I can affirm that there’s no such thing as a 7-inch tart pan in any kitchen supply shop in Manhattan: I hunted! There are 7-inch fluted quiche pans, but this tart had to have a top crust as well as a bottom one, and it ain’t easy to seal two crusts together on the sharp metal edges of a fluted pan. I already had one of those, so I settled for it. I can’t think of a reason for that change. There’s nothing difficult or odd about the Toklas version, aside from its being very lush with the butter. To form the tart I first divided the dough strictly in half to see if one recipe’s worth would really stretch to a double crust. To my surprise, it did. Once the bottom crust was in the pan and filled, I managed to roll out another round of dough (thinly!) large enough for the top, got them sealed together, and baked the tart at 350° for 45 minutes. It came out low, flat, and plain looking, but I had hopes for it. Which were well rewarded: The tart was terrific. A little sprinkling of powdered sugar dressed up its plainness. The pastry was extremely crumbly, almost cookie-like. If I hadn’t used a detachable-bottom pan, I’m not sure I’d ever have gotten pieces out without their totally falling apart. The crust was indeed tender and quite delicious. The crunchy filling contrasted texturally and tasted of the pure soul of hazelnuts. 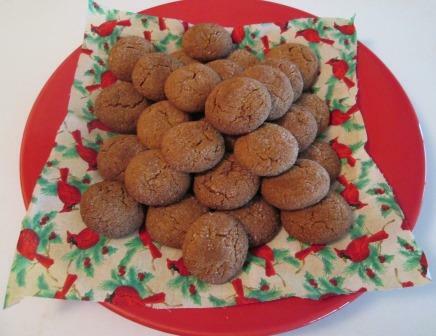 Its egg-sugar base was just a light binding for the nuts, in no way heavy or cloying. 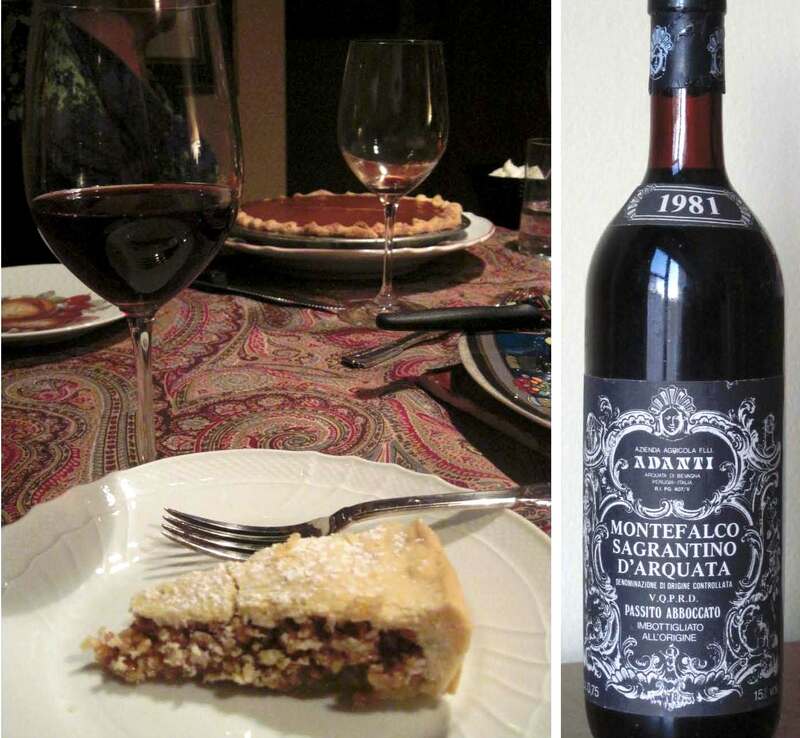 Small slices of the tart were heavenly with the dessert wine that Tom had brought to accompany it: a 1981 Adanti Sagrantino di Montefalco. This is a red passito wine made from the Sagrantino grape, a specialty of Umbria – rich and satiny, with enough acidity to moderate its sweetness and make it work beautifully with the not-too-sweet dessert. Rich as the tart was, the six of us only got through half of it – since there was also an excellent pumpkin pie to be enjoyed. Leftovers of the tart were divided and taken home by the very happy Thanksgiving diners.